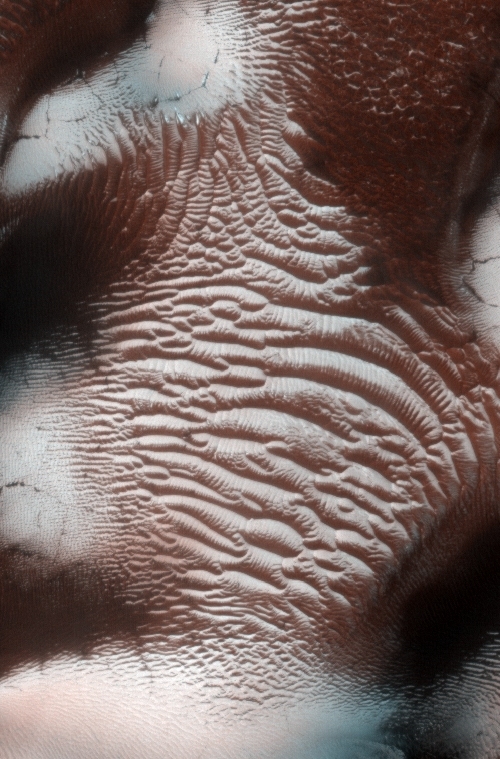 Thanks for the HiRise image. That seems to be a lot of water ice to be from condensation. Could it have been a frozen lake that has sublimed away over eons and now that is all that is left? It's just a thin layer of ice on top of a dune mound. 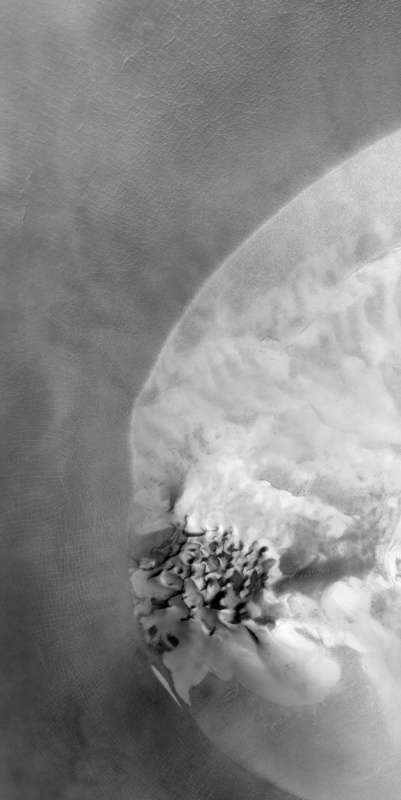 Many craters have such a dune mound, for example the famous Victoria crater. It seems the mound is cold enough and under enough atmospheric pressure to facilitate water condensation and keep it there. I would say its sulphate. You see alot of it in the rover tracks. Saying its water ice is stretching it. Well if NASA, ESA and Phage think it is water ice, I am going to go with water ice. Not that I trust "Never A Straight Answer", but in this case I highly doubt it is sulphate. Close examination of the image seems to rule that out. What's the dark pluim of smoke doing there at the bottom? That dark brown, disturbed area near the bottom of the original pic looks interesting. Would that not be a great place to check for some possible microbial life? 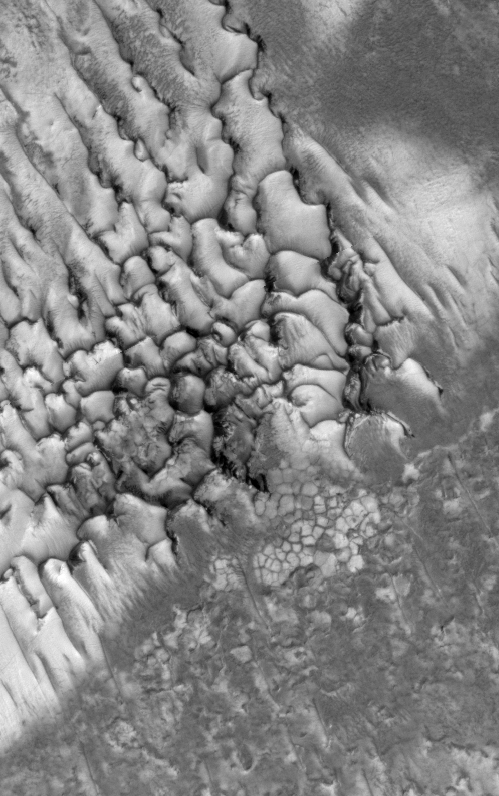 There are large, dome shaped features in that patch. Interesting indeed! argon and carbon dioxide are reactive. any hydrogen mix oxidizes immediately. water is still h2o, no matter what planet you are on. Some readers have asked, how do we know the white substance is not frozen CO2 (dry ice) instead of frozen water? 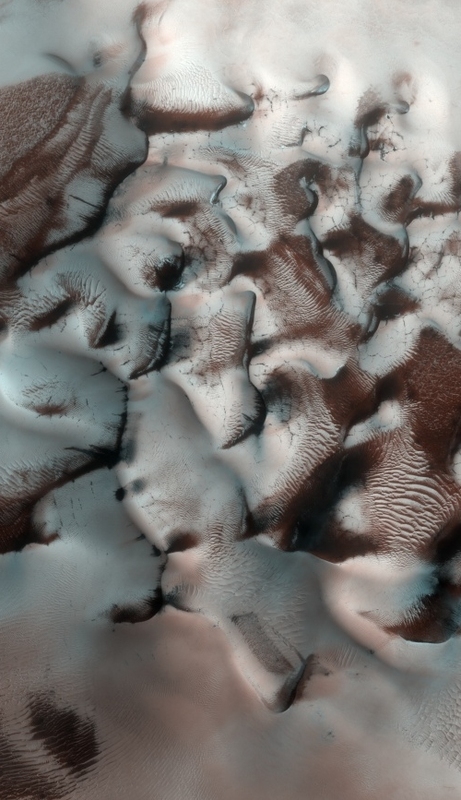 Answer: Phoenix's landing site is too warm for dry ice. The average daily temperature is about -70 F while dry ice requires temperatures lower than about -109 F.
Finding water was one of the key goals of the Phoenix mission. Although H2O has trouble flowing as a liquid on the surface of Mars, it may be able to liquify, from time to time, just below the surface, providing a habitat for martian microbes. Exciting stuff! Stay tuned as the digging continues. there's nothing wrong with inquisition and asking more questions, in fact its better than just quoting and believing whats simply written. but ut seems there is some chance it may be frozen water; albeit the hydrogen would decompose in the mix of argon no matter what planet you are on.